Definition at line 54 of file lltransfertargetfile.h. Definition at line 40 of file lltransfertargetfile.cpp. Definition at line 48 of file lltransfertargetfile.cpp. References llendl, llerrs, mFP, and NULL. Definition at line 65 of file lltransfertargetfile.cpp. Definition at line 105 of file lltransfertargetfile.cpp. 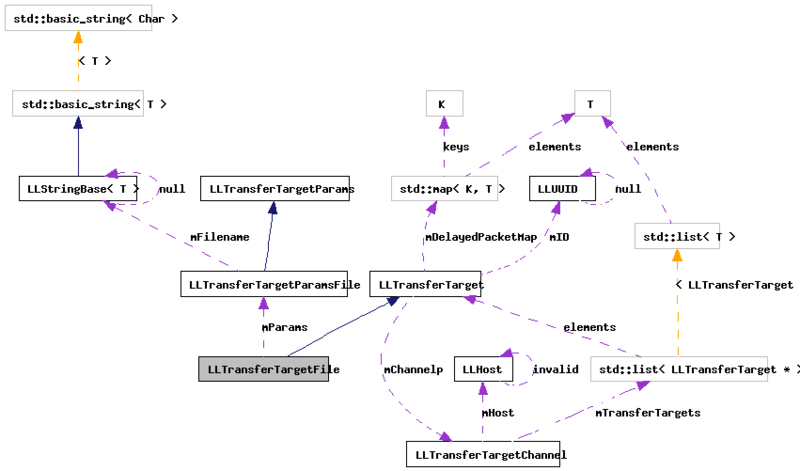 References llendl, llinfos, LLTS_ABORT, LLTS_DONE, LLTS_ERROR, llwarns, LLTransferTargetParamsFile::mCompleteCallback, LLTransferTargetParamsFile::mFilename, mFP, mParams, LLTransferTargetParamsFile::mUserData, NULL, and LLFile::remove(). Definition at line 76 of file lltransfertargetfile.cpp. References count, LLFile::fopen(), llendl, LLTS_ERROR, LLTS_OK, llwarns, LLTransferTargetParamsFile::mFilename, mFP, mParams, and S32. Definition at line 59 of file lltransfertargetfile.cpp. Definition at line 72 of file lltransfertargetfile.h. Referenced by completionCallback(), dataCallback(), and ~LLTransferTargetFile(). Definition at line 70 of file lltransfertargetfile.h. Referenced by applyParams(), completionCallback(), and dataCallback().